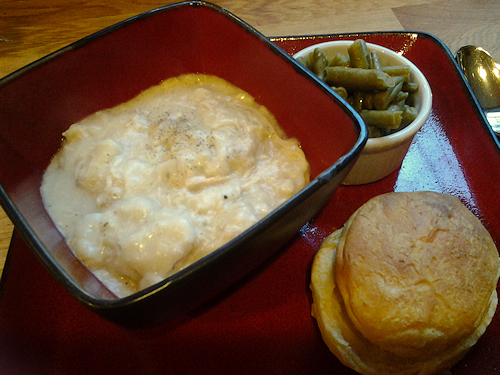 Posted by thereluctantcountrygirl.com in Chicken, Country Cooking and then some! That’s right no fail, well I can’t help you if leave them to go write on your blog and they burn but up to that point yes I can assure you this is a no fail recipe. Did you ever wonder how come Cracker Barrel just gets it right every time? 1 word “Simple” they keep it simple. So let’s get started! I always start this one the night before. 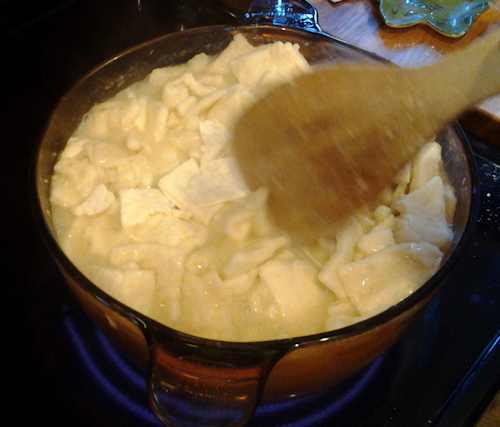 So I am skipping some pictures here because I am quite confidant you all know how to boil a chicken. You buy a whole small chicken, take it out the package , rinse and put it into boiling water with about 2 TBS salt and 1TBS pepper and 1/4 stick of real butter and boil it for about 45minutes. Now when it’s done I let it cool right there on the stove while I eat the real supper I made that night. Then after cleaning up from that nights events and I know the pot has cooled down sufficiently, I place the covered pot into the fridge over night. 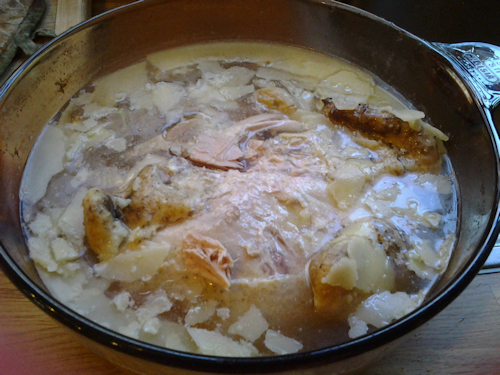 This not only lets the chicken get cool enough to pull apart but lets all the juices seep into every bit of that broth. When you pull this back out of the fridge the next day ( for me when I get home from work) you will see the butter solidifies to the top. That is OK!!! Your chicken is now nice and cold and so easy to remove from the bones as well as get rid of that excess fat. It will almost fall apart in your fingers. So let’s grab a trash bowl to set beside you and this way when you take the bones out you will have somewhere to throw them away fast. When you shred the chicken you drop it back into the broth pot. 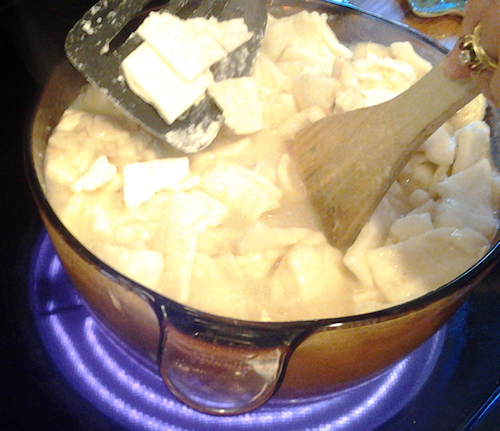 When done place your pot on the stove, add the other 2 TBS of salt now and heat until it reaches a boil while we get those dumplings ready. 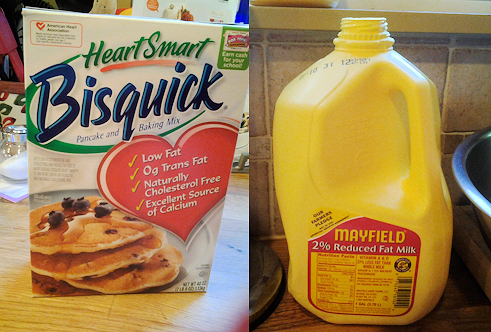 This is where these two items come in…the Bisquick and the milk. 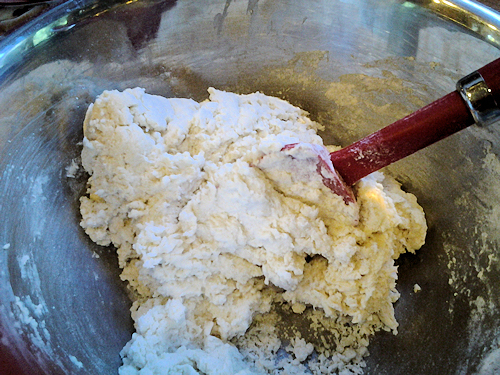 Put 4 heaping cups of Bisquick and 1 1/3 cup of milk into a mixing bowl and mix until you get dough. 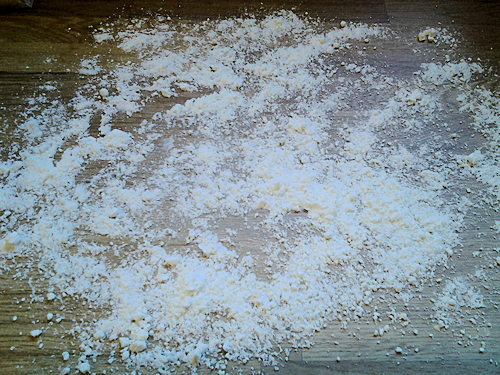 Throw some extra Bisquick down on the counter and get that rolling pin out! 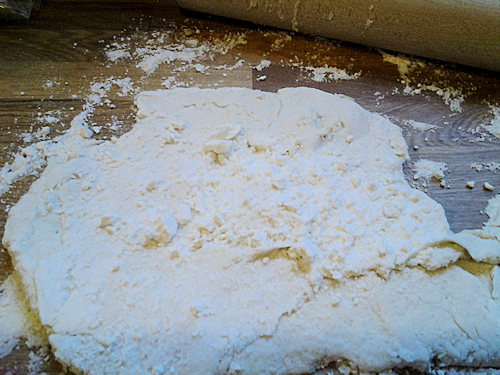 Place about a 1/3 of the dough on the counter and work in some of that flour you threw down into the dough so you can roll it out easily just until it is no longer sticky if you need to add more Bisquick to the surface do so. 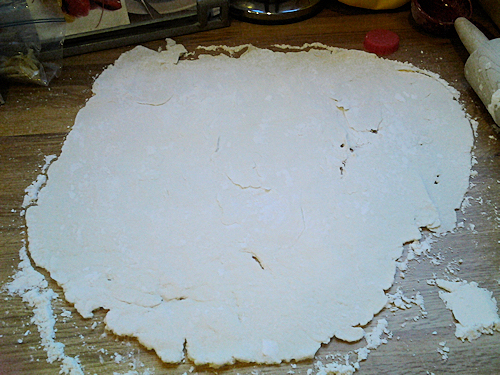 Roll it out thin like a pie crust only no one cares what this looks like..phew! Mmmmm can you smell that chicken broth. Let’s cut this dough! 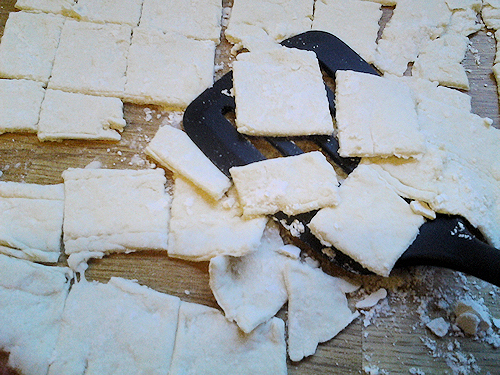 Cut into small squares using a flat knife in about 1×1 if you want to be technical. Please don’t measure them and if you are stop reading my blog right now you will get disgusted with me very quickly, I am no where near that technical. Hehe. Stop staring at my squares, in fairness I warned you. 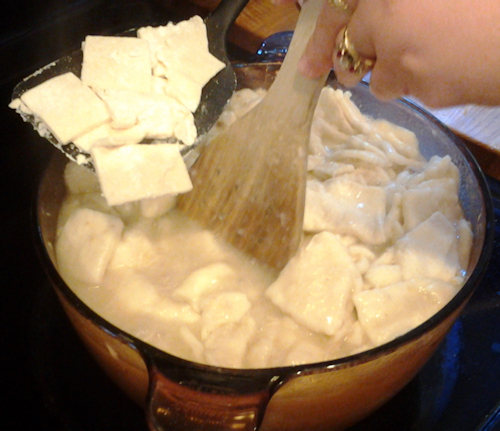 Now let’s get these um squares in that boiling broth! Simply slide these babies up with a spatula and slide them into the boiling water. They should glide right off. They will float and become more dense as they boil , this is where I turn down the heat a tad , stir them around a bit but not hard more like push them around. Start your next batch of dumplings. Take another third of your batch and repeat the last steps from above but this time when putting them in the pot, take a flat spatula and make some room to slide them in so they dont stick to the other dumplings as much. 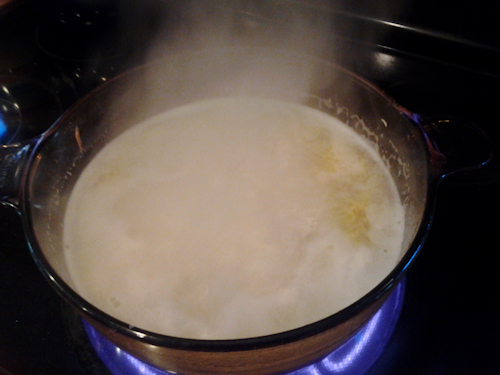 This is where you decide if you would like more broth, is there enough liquid to keep a nice boil? If not go ahead and add a cup of chicken broth. If you want a thinner broth still then add the second cup as well. 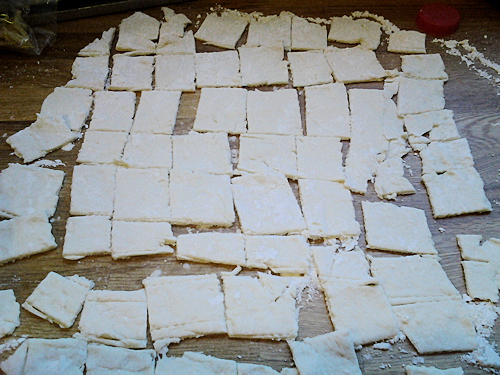 You want to kind of roll each batch of dumpling squares in stirring under to top in a rolling kind of motion. Like you would whipped cream. It’s a gentle thing and these are so worth it. Now when all of the dough has been added to the pot we want to turn it down to low. 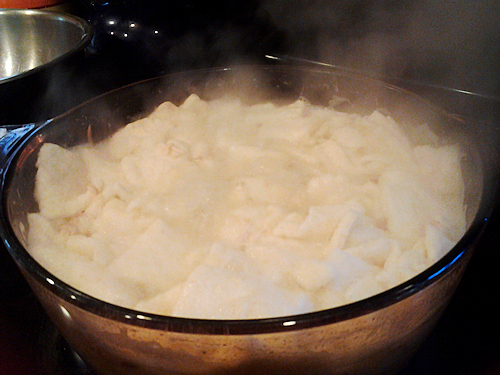 Let the dumplings simmer stirring occasionally, so don’t go read your email quite yet. I let it simmer for about 20 min. This is wonderful the fist night but wait until the reheat!! 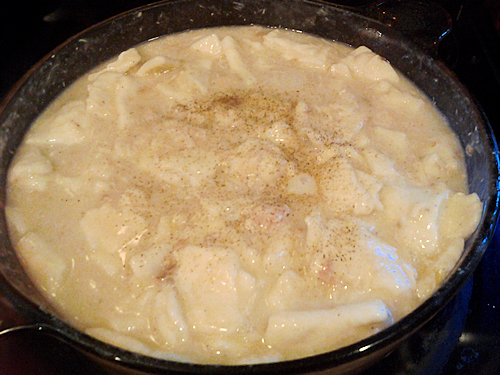 This batch easily makes enough for six to eight people. Add salt and pepper to taste at this point and you are all set. Let me know how you liked it! This is hubby’s favorite comfort food besides his bacon of course, it may not be Cracker Barrel but trust me it is the closest I am going to get here. Are you looking around for the veggie? It’s not going in this pot but of course if you want to go North on me you could of added some mixed vegetables. For me and this dish I’m staying South this time and putting my veggies on the side.